Wow what a freaking bad day yesterday was for cruising. First the Navigator of the Seas and now this. 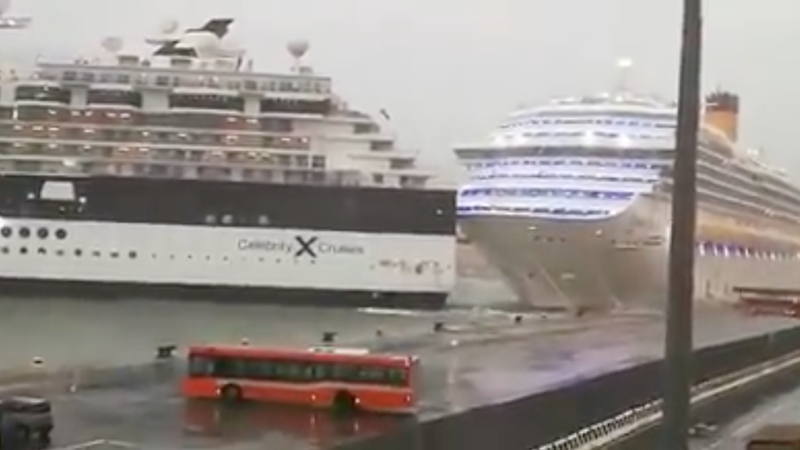 Here we go: On October, 29, 2018, the Celebrity Constellation broke away from her moorings due to bad weather in La Spezia, Italy. Constellation was originally called to this port in order to avoid a bad situation at sea in this storm, but ended up in trouble anyways. At approximately 3:30 PM, the ship broke free from the mooring lines due to strong winds. Constellation then proceeded to drift right into the Costa Magica. See the video below. The local Italian tugboats came to the rescue, and were able to get the Constellation back under control and re-moored. There have been no reported injuries, and no major damage to either of the ships. Celebrity Constellation is currently coming to the end of an 11-night Mediterranean cruise which departed Civitavecchia on October 19. The ship is expected to return as normal to her homeport which is the main port for Rome on October 30.